Original station built under British in 1771. Thacher Island is a little over a half mile from the mainland, near Rockport. Thacher Island was visited back in the early 1600s by explorers Samuel de Champlain, and Captain John Smith. The island was named after Anthony Thacher, who was compensated when his ship Watch and Wait, carrying his family, passengers and crew, crashed on the island on August 14, 1635, during a fierce storm. Thacher and his wife, Elizabeth managed to make it to the island following the shipwreck, but the storm claimed four of their children and seventeen other lives. He bestowed the name “Thacher’s Woe.” Eighty years later the Colonial government purchased the land to establish a light station. Cape Ann Light Station was a site for several lighthouse experiments over the years. In 1807, Winslow Lewis, an unemployed ship’s captain, developed an Argand Light, which he tested at Thacher Island. It proved brighter and more fuel-efficient than the previous light, and in 1810, the government bought the patent and contracted Lewis to replace all the lanterns of American lighthouses with his invention. Keeper Charles Wheeler also was an inventor and performed experiments to create a special oil that would not freeze during the winter in the late 1830s which he used successfully on the lighthouses. One of the worst storms in New England's coastal history struck in November 1898 and was named as the "Portland Gale" for its loss of 200 lives on steamer Portland. The assistant keeper at Thacher Island, Albert Whitten, is believed to have been the last person to have seen the vessel in trouble far out in Massachusetts Bay, as the storm was too dangerous for any rescue attempts. In 1919, President Woodrow Wilson was returning from Europe aboard the S.S. America. The ship was in a heavy fog and heading directly towards the rocky Thacher Island, when at the last moment disaster was averted by the station's fog signal. The original 10-foot tall first order lens from one of towers was displayed until 2011 at the Coast Guard Museum in New London, Connecticut, where it was carefully removed and placed into storage. In 2013, this huge complex lens was carefully moved to the Cape Anne Museum in Gloucester, and painstakingly put together for visitors to enjoy today There are only 39 of these special lenses in the country today. In 1864, Alexander Bray, a Civil War veteran, was appointed as Keeper of two newly constructed towers on Thacher Island known as the Cape Anne lighthouses. On a cold December 21, in 1864, one of Bray’s two assistant keepers became very ill with a fever and needed medical attention on the mainland. He and his other assistant loaded the ailing man into a boat bound for the mainland a mile away to find a doctor. His wife, Maria Bray, and her 14-year-old nephew Sidney Haskell, were left in charge of the tower operations. The weather was cloudy and the winds were blowing, but Keeper Bray seeing the trip would be rather short, felt he would be able to return that same day. That afternoon, a fierce winter storm blew in and covered Thacher Island in blinding drifting snow. Maria knew that the lights must be kept burning for the safety of any ship caught in the disaster, and for those on the mainland. The storm was relentless as Maria and her nephew braved the snow and wind to carry the lantern fuel up 148 stairs in each of the two towers. She had to repeat the daunting trip three times during each of three nights to keep the lamps supplied with oil and the lantern room panes free of soot. Alexander remained stranded with his two assistants on the mainland, but much to his gratification, he could still see the lights of the two towers were still burning. Daybreak on Christmas Eve of December 24 brought a slight calm through the still raging storm. Keeper Bray, fearing for the safety for his wife and nephew on Thacher Island, decided to head for the island with his assistants as the lights were still burning to guide him. It was a joyful Christmas Eve as the Brays and their assistants were reunited. A Coast Guard Cutter was named in her honor in 1998. There are plenty of beaches in the Gloucester and Rockport area as well, some are quite large for those that like long walks, and there are some quiet smaller ones as well. Gloucester’s Stage Fort Park is a spacious park with two beaches, Half Moon Beach and Cressy’s Beach. Wingaersheek Beach and Good Harbor Beach in Gloucester are two of the most popular. Long Beach covers both towns. Rockport’s Front Beach is small and intimate, with places to eat you can walk to, and there is Back Beach and Old Garden Beach, which are small and a little out of the way, but with great views. 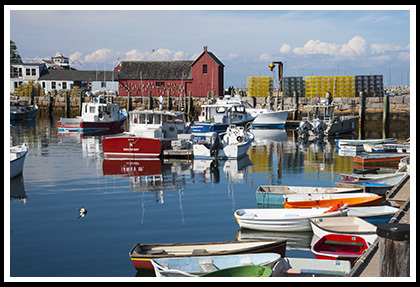 Rockport is still one of New England’s main artist attractions with its picturesque community painted and photographed by many artists, with lots of specialty shops, galleries, and restaurants to explore, and beaches. Most famous is the red fishing shack known as the harbor “Motif Number 1” on Bradley Wharf. Visitors will also find a half-mile jetty to explore nearby. For something truly different, visit the paper house made out of 10,000 newspapers in 1929 and still standing. You can actually explore Thacher Island if you join the Thacher Island Association (see below). You can then take one of its many shuttles to the island during the summer months. Only small rowboats and kayaks are allowed to land on the ramp so if you have one, you can use it to access the island. Rustic campsites are also available with reservations. There are various tour boats leaving out of the T Wharf in Rockport for all kinds of recreational activities like fishing and sailing. The island is best viewed by boat but they can be viewed a half mile from the shoreline. Take US Route 95 north to Route 128. Follow Route 128 to Route 127A. From South Street to Penryn Way. From Penryn to Penzance Road. Follow Penzance Road to the shore, from where you can see the lights a half-mile away. Turn right at Broadway (MA -Route 127A) and T Wharf will be on your left. Boat cruises mentioned below may offer many types of cruises. While some may offer specific lighthouse cruises, some will pass by Thacher Island Twin Lighthouses during charters, narrated wildlife and historic tours, whale watching, fishing tours and other types of excursions. 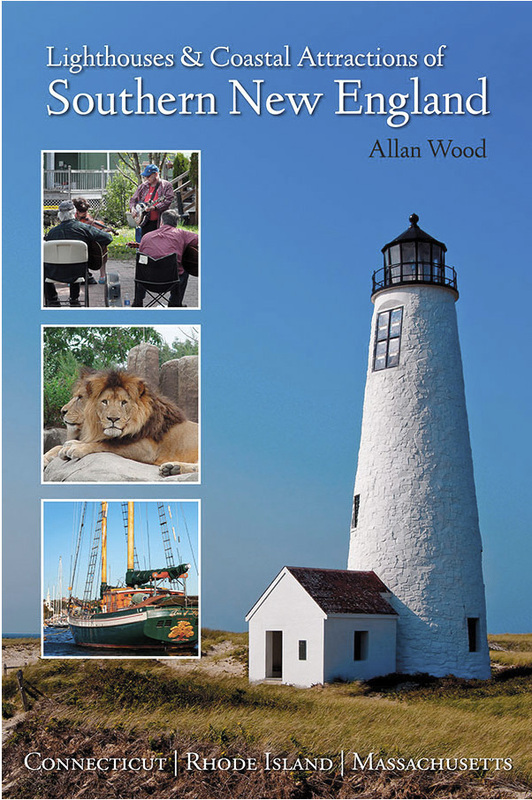 Provides tours to Thacher Island and allows members to explore around the lighthouses. 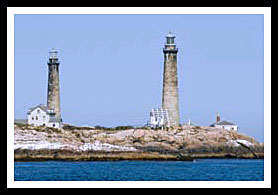 Thacher Island can also be seen up close by catching the Lighthouse Cruise tour. Passes by the lighthouse as part of their Northern Lights Tour. You'll also find in more detail, the famous story of Maria Bray, the keeper's wife who tended Thacher Island Twin Lights during a fierce winter storm, as mentioned above.